If you want to find out but aren’t quite ready to take the plunge with a full certification course, a Discover Scuba 1hr pool try dive will let you try scuba to see if you like it. ​With our maximum ratio of 2 students per instructor (or one per family) no one is ever rushed through, its all at your own pace. While not an actual scuba certification, during the scuba dive experience you’ll learn how to use scuba equipment in shallow water and get a quick and easy introduction to what it takes to explore the underwater world. There is nothing like breathing underwater for the very first time. It takes a little getting used to – after all, human beings weren’t designed to do that – but after a few minutes of awestruck wonder, most participants realise how easy scuba diving really is. The biggest challenge instructors have with the Try Dive programme is not coaxing participants into the water, but coaxing them out when the programme is over. The fun part? It’s all fun! You learn the basics you need to dive under the direct supervision of a PADI Professional. One thing you’ll learn is that you really can breathe underwater and whether you like doing that or not. You will learn what wearing scuba equipment feels like and how easy it is to move around underwater while wearing it. 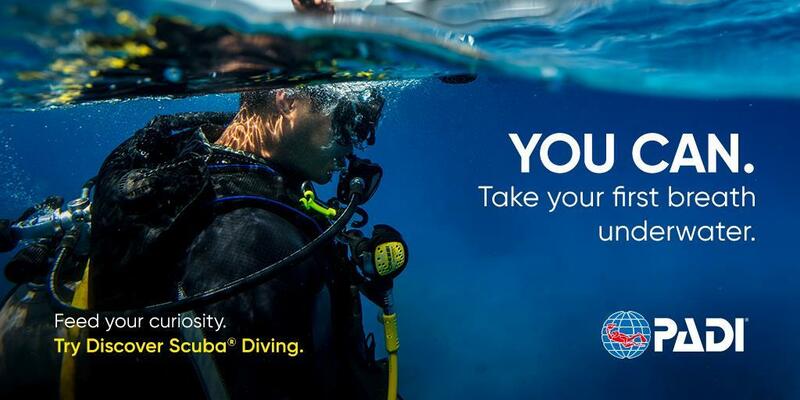 All the equipment you will need is included in a Discover Scuba Pool Try Dive experience. You'll just need to bring a towel, your swimming costume and a T-Shirt you don't mind getting wet in the pool. You’ll use all the basic scuba gear including a mask , snorkel and fins, a buoyancy compensating jacket that also carries your scuba tank, a weight belt and a scuba regulator to breathe from and instrumentation to monitor depth and air supply. You may also wear a scuba shorty wetsuit, these can be supplied for you as well. Just your willingness and undivided attention. We supply everything else! We'll post you the PADI Discover Scuba pack which contains loads on information on your session once you've completed your Discover Scuba pool session you can download a PADI attendance card to your phone! Join Scuba Earth (the PADI online forum) and even get free access to the first part of the Open Water course online materials for free! To take a Discover Scuba Pool Try Dive you must be at least 10 years old and complete a standard liability and medical questionnaire form. Once you complete a Discover Scuba Pool Try Dive programme, you’ll want to check out the Open Water Diver certification course. Held during our regular weekly pool session on Thursday evenings at the Filton Leisure Centre in Filton, Bristol.